Not feeling the annual dinner-and-a-movie for Valentine’s Day this year? 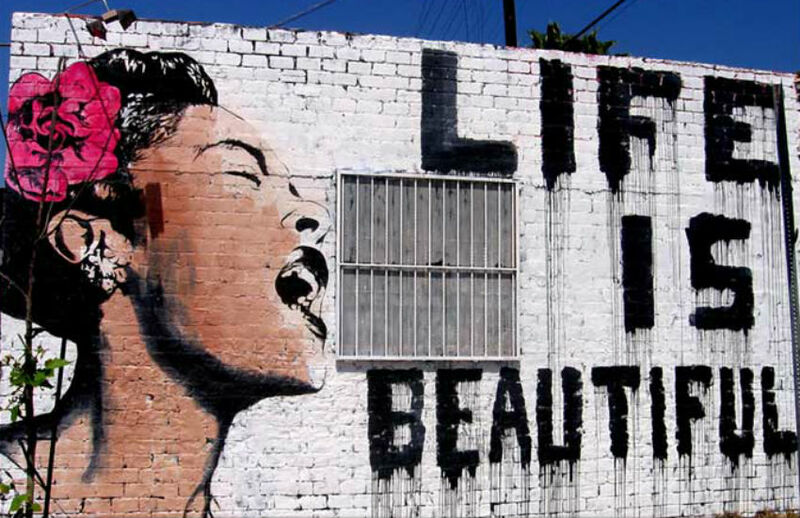 How about grabbing your special someone’s hand and taking a guided tour of some of L.A.’s amazing street art? Stencil graffiti, sticker art, wheatpaste poster bombs—these are just a few of the kinds of street art that Lizy Dastin’s tour of the Arts District in downtown L.A. includes. Dastin, who has a background in art history, began offering tours in different areas of Los Angeles a few months ago (tours of the Beverly Hills sculpture gardens are available, and tours of the Venice and Hollywood areas are in the works), and recently invited us along for a ride. Our next stop is at the corner of Traction and E. Third, where a Lichtenstein-inspired mural by Tristan Eaton stands out. The image, primarily composed of a close-up of a woman’s face, also contains the phrase, “I was a Botox junkie.” Dastin emphasizes the social context of the piece, as well as discussing Eaton’s relevance as an artist, and his methods. One of the most compelling aspects of Dastin’s tour is her background knowledge of each piece: she has attempted to track down and interview as many of the individual artists as possible—an impressive achievement, given the evanescent nature of street art. She offers a behind-the-scenes perspective on many of the pieces, talking about the context in which they have been created, and explaining how the artworks are affected by the controversial citywide moratorium on murals. The walk—which lasts about an hour and includes discussion of approximately eight artworks—concludes with a consideration of a political piece by artist and activist Shepard Fairey. The piece presents the viewer with an enormous image of Reagan holding a sign reading “Legislative Influence for Sale.” Unlike some of the other works on the walk, which are made by unnamed or lesser known artists, Fairey’s name is familiar, making his work a fitting finale. While the personal bespoke tours are expensive at $200, you can take a self-guided audio tour for $12.99. Downloads and maps available at Dastin’s website.